Flowing Into One An eclectic collection of songs and chants in different languages, from various cultures and styles, composed between 2005 and 2011. With inspiring upbeat, as well as meditative and devotional songs and chants in Sanskrit , Latin, English. This CD gives a rich and broad taste of Angelika’s inspirational music and features 11 tracks Total time: 70 minutes. Benediction Benediction is Angelika’s musical conception of various prayers in Aramaic, Latin, Greek, Hebrew and English. 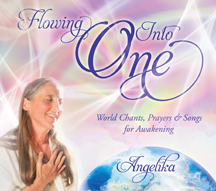 A mystical, devotional offering, infused with the love, light and presence of Christ and Mother Mary, intended to bridge cultures, religions, languages and ways of worship, Angelika’s prayer is that we learn to rejoice in each others different ways of seeking the one divine source. Kyrie Eleyson was spontaneously channeled from a space of communion and is in its original form with the 3 vocal tracks all spontaneously received one after the other and fitting together without any composing, planning, editing or change.11 tracks. Total time: 72 minutes. Deeksha The Moola Mantra, especially imbued with the power of Divine consciousness and other ancient Mantras – Words Of Power – and chants in the Sanskrit language transport the listener easily into a peaceful state. 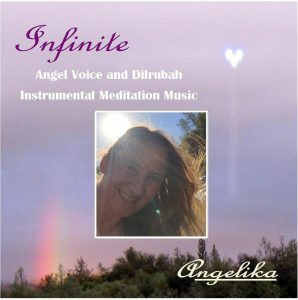 Angelika channels heavenly sounds and healing energy through this music. The creation of this CD was inspired by Oneness University and the transmission of Divine Grace through Benediction, Deeksha. Some titles are over 10 minutes for meditation and sacred ceremony. 10 Tracks Total Time: 77 minutes. Flying Home, Instrumental This CD is a special order. It may take a little longer. It captures the spirit of the migrating birds, their own voices and the feelings they evoke in us: the longing to fly home. Let yourself take off with these flocks of geese and cranes and experience an inspiring musical migration flight. One of the titles of this collection is a beautiful instrumental version of the German folksong: “Lorelei”. There are 20 tracks with 11 instrumental music titles and alternating nature sound tracks.